A very engaged group of members attended John Loveridge’s presentation on the life of Sir Robert Gordon Menzies, Australia’s twelfth Prime Minister. He was born in Jeparit, Victoria and at the age of 13 yrs bright young Robert won a scholarship to attend a private secondary college. Later at university he gained both Bachelor and Master of Laws, but among the undergraduate community, although recognised as unusually bright and a skilful debater, he displayed ‘attitude’ that would work against him during his career. 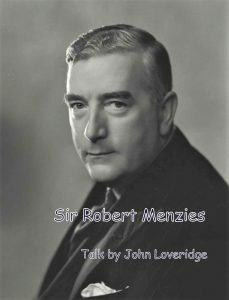 John took us through the many stages of Menzies’ life, his legal and political career highlighting certain notable events, typically controversies that faced him in wartime. Always a resolute leader with outstanding power of oratory and often cutting wit, he dealt firmly and fairly with industrial issues while committing his energies to growing Australia’s economy. 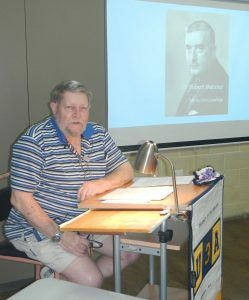 John made his talk the more enjoyable by often putting aside notes that he had made from a biography by A W Martin, to give us ‘ad lib’ interesting snippets of information or personal anecdotes relevant to the Menzies story. 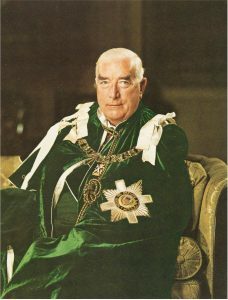 Following retirement as Prime Minister in 1966, Mr. Menzies was elected Chancellor of Melbourne University and around that time was made Warden of the Cinque Ports. After a life of great achievement and having been honoured with a knighthood by the Queen, Sir Robert Menzies died aged eighty three. Australia gave him a state funeral.